But that’s not right, is it? First off, what is this thing we call Pentecost? Well, let’s just say this feast did not begin with Acts 2. It had actually been going on for quite some time. Pentecost and the Jewish Feast of Weeks were synonymous (but the word Pentecost comes from the Greek). It was a Jewish feast that remembered the giving of the Law at Mount Sinai. The Hebrews came out of Egypt via the great exodus; they went through a kind of baptism as they crossed the sea. Now they stood at the foot of the mountain to receive the torah of God, his instruction. I’ve redeemed you, now here are the ways in which you are to live. ~if Moses were to summarise things. At that very first Pentecost at Mount Sinai, the torah was given on tablets of stone, they pretty quickly broke the instruction (remember the golden calf) and we then read that 3,000 people were put to death. You can read about it all in Exodus 32. So fast forward many, many centuries down the road to what we have recorded in Acts 2. Here on the celebration of Pentecost, 50 days after Christ’s resurrection, the Spirit was poured out, the law was written on the hearts of men and women, and immediately we see 3,000 were added as disciples of Jesus Christ. Quite a contrast, to say the least! I think the Jews would have caught this most unique event. But back to the belief that the church began at Pentecost. I don’t really think it did. Of course, some will point out that the word church (or ekklesia in Greek) was used 3 different times in the Gospel of Matthew (once in Matt 16:18 and twice in Matt 18:17). So, in some sense, one might accept that the church began in ‘the New Testament times’, often referred to as ‘the church age’. But I still believe that misses the point. Here’s what I’m getting at. Most know that the Old Testament and New Testament come to us primarily in 2 different languages. Hebrew in the OT; Greek in the NT. Not only that, but we normally read the text in English. So we miss nuances of word translations. As noted above, the word church is ekklesia in the Greek. It was a word that could be used in general life that meant ‘a convened assembly of people.’ For example, see Acts 19:32, 39, 41. And this is the word that the New Testament writers took up to describe God’s people, those who were marked by faith in Christ. Do you see the interest here? Our word church comes from the Greek ekklesia, which is synonymous with the Hebrew word qahal. We’re working with the same meaning across the 3 languages. This is why the Israelites could be referred to as an assembly (or congregation), an ekklesia. See Acts 7:38. So when you turn to the Hebrew of the Old Testament, one finds Israel being called an assembly (a qahal). A few examples to look at: Ex 12:6; Deut 9:10; Judg 21:5; 2 Chron 6:3; Neh 8:2; and so on. But why is this important? Surely this article isn’t simply about the etymology of a word. What I’m trying to get us to see here is that the church, the ekklesia, the qahal of God did not begin at Pentecost. It had been going on since the beginning, since God formed a community of people. We’ve got one larger narrative running across Scripture. The qahal of God, his firstborn, which we read about in the Old Testament, was to be the community of people making known the rule of the one true God to all the nations. They failed. In steps the true firstborn, Messiah Jesus. And from that Messiah, the ekklesia of God’s people marked by faith in the faithful Messiah, continue on. But now this qahal, this ekklesia, this church, this assembly is very clearly made up of both Jew and Gentile. However, it’s still one group, one assembly. We didn’t begin some ‘church age’ at Pentecost, nor in the New Testament. This church-ekklesia-qahal had been going on for a very long time. 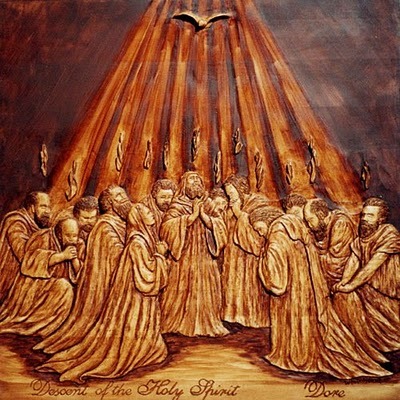 Pentecost was a fantastic marker in the history of God’s work amongst humanity. But it was about fulfilment and enlargement – into the purposes of God. The Spirit was given for all, the mission of God was to go out to all, the community of God was to include all those marked by faith in Jesus. If anything, we are only continuing the what started once upon a time. And we continue to live out this Pentecost feast even today. This entry was posted in Acts 2, church, Pentecost and tagged Acts 2, Church, Pentecost. Bookmark the permalink. When the New Testament writers quote scriptures from the Old Testament, we frequently see differences when compared to our own bible translations. This is because Jesus and the Apostles mostly quoted from the Septuagint. This was the Greek translation of the Jewish scriptures, in common usage during the time of Jesus and used throughout the old Greek empire. The Septuagint translation was made several hundred years prior to Christ. When we read the Septuagint verses related to the gathering of the tribe of Israel, as say in the wilderness, we find the Greek word used for ”congregation or assembly” is in fact ”ekklesia”. I am guessing that this is also the places which you have earmarked as ”qahal” in the Hebrew. It is quite obvious that neither Jesus, nor the apostles, were regarding the “church” as a brand new venture they were starting. To use an interesting word, they were into ”continuationism” of a work which had been started in antiquity! Only this time they had oodles more power spread abroad.